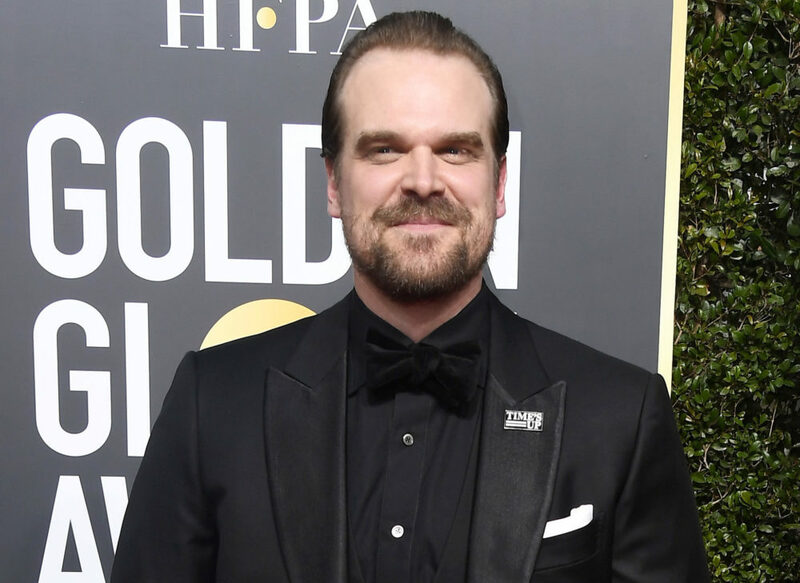 Stranger Things star and all-around lovable guy David Harbour has officially made another Twitter pact, and while he’s upped the stakes a bit this time, it appears even he can’t outwit the internet. Back in October, a fan asked Harbour how many retweets it would take for him to take her senior pictures with him and he told her it would take 25 thousand retweets and a few minor stipulations. Harbour seemed to have highly underestimated his popularity on the internet as the fan reached her goal the very next day — alongside some enthusiastic support from fellow Stranger Things star Noah Schnapp. Harbour made good on the bet, and those stunning photos will live on as the best senior pictures in existence. But now, another fan has come forward to ask Harbour to officiate her wedding in September and guess what, he’ll do it…for 125 thousand retweets. Harbour tweeted back that he’s definitely game to become an ordained minister for the wedding, as long as scheduling for Season 3 of Stranger Things allows — and she reaches his retweet goal. Naturally, Harbour also had a few minor stipulations of his own. "125k retweets," he wrote. "Provided date works with s3 shooting schedule, I will get ordained and perform ceremony. I get to read an esteemed love letter of my choosing, and after the cake is officially cut, I get the very first piece. #allthecakes"
Harbour certainly raised the stakes, upping the retweet goal from his last Twitter bet five times over. But it seems even Harbour may not be a match for the internet as Ericka’s original tweet currently has garnered over 63 thousand retweets as of publication, and is rapidly growing — Harbour’s response is currently sitting at 87 thousand retweets. When asked why he wouldn’t let the couple have the first piece of cake on their big day, Harbour clarified that while he’ll allow traditional wedding cake events to take place, the first official piece handed out — that’s all his. Well, it seems like our favorite Chief may have pause his duties to serve and protect the people of Hawkins from supernatural forces — but never put down that glorious hat — because it seems he likely has a wedding to officiate in September. But if Ericka’s quest is successful — and we’re seriously hoping it is — we definitely think she should make another request: Harbour has to tear up the dance floor at the reception. I mean, come on, who wouldn’t want to be in the presence of this on their big day? Here’s hoping Ericka reaches her goal and Harbour gets a plus-one (ahem, Joe Keery) to attend the wedding.